Half a century after the Apollo Moon landings veteran space journalist Leo Enrighthas suggested that the first person on Mars could be a Scottish woman. Leo Enright, who interviewed many of the early astronauts during his years with the BBC, is one of the speakers at the Big Bang Weekend taking place in Wigtown, Scotland’s National Book Town, from 8 to 10 March. Among the audience will be local lass, 14-year-old Helena Cochrane, who has her own garden observatory and high quality telescope, and would love to visit the red planet. Her fascination with space began when she was seven and started to meet scientists, astronomers, astronaut trainers and others who came to Wigtown for the annual book festival each September and for other events, like Big Bang, organised by the Wigtown Festival Company. 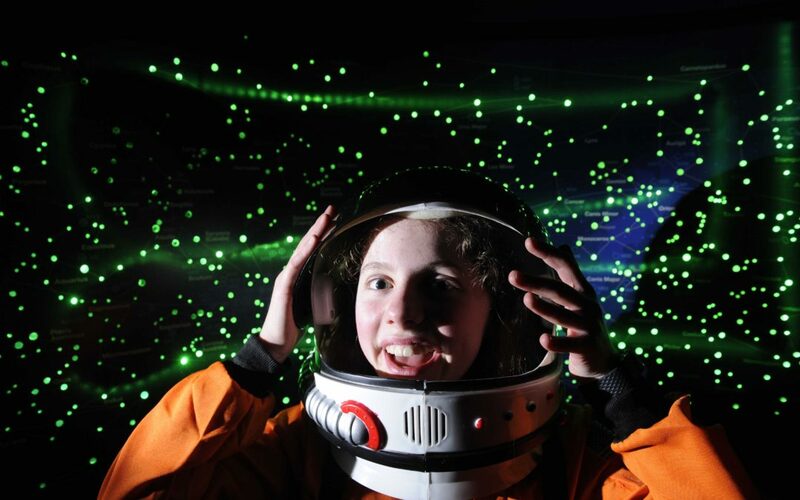 Now she loves to stargaze from her “Dark Sky Den” and is studying sciences at school, which could pave the way for a career in Scotland’s blossoming space industry. Helena said: “Going to Mars would be really cool – I would love the chance to go there. “It’s astonishing to think that people could be on Mars in my lifetime, and it would be amazing if one of them was a Scot like me. And even if I never go into space I might have a career where I help another girl from Scotland to get there. Helena (in common with some of her friends in S2 and S3 at The Douglas Ewart High School) has not decided what she wants to do for a career but hopes the options will include areas like space research and engineering, or working as part of ground control. It’s something that Leo Enright applauds. As a reporter for the BBC and then for Ireland’s RTE he covered every major event in space exploration for 50 years, including Neil Armstrong’s Apollo 11 Moon Landing of 1969. He got to know many of the Apollo astronauts personally and is keenly interested in what the next stages of exploration will be. In his Wigtown talk Leo will look to the past and the future – asking if we will ever dream as big as we did in the first space race. One important factor could be whether the 2020 European mission carrying the UK-built robot Rosalind the Rover (named after British scientist Rosalind Franklin) discovers life beneath the Martian surface. Currently writing a book on Ireland’s role in space exploration, he believes that people there and in the UK often don’t realise the scale of the contribution made by their countries. Adrian Turpin, Wigtown Festival Company artistic director, said: “The Big Bang Weekend is a superb chance to meet some remarkable people who have witnessed, and been part of, humanity’s afforts to reach out into space. A series of guests at the Wigtown Festival Company’s third annual Big Bang Weekend, from 8 to 10 March, will reveal how the country has become a magnet for space researchers and satellite builders. Another speaker at Big Bang will beClaire Barcham, UK Space Agency’s Director of Commercial Space who believes Scotland has a bright future in space. She said:“New technology is reducing the cost of access to space and there is an exciting opportunity for Scotland and all of the UK to thrive in the new space age. We have world-leading capabilities in small satellite technology, telecommunications, robotics and Earth observation. “Our space sector employs 41,900 people and, in Scotland, the industry is punching well above its weight with 18 per cent of those jobs based here as well as some of the best universities in the world for space science. One of the most exciting projects of our Spaceflight programme includes £31.5 million in grant funding to support small satellite launch from a new spaceport at Sutherland in Scotland. Organised by– Wigtown Festival Company, 11 Main Street, Wigtown, Dumfries and Galloway, DG8 9HN. Wigtown Festival Company is limited by guarantee with charitable status. Charity number SCO37984. Leo Enright is an award-winning broadcaster specialising in the politics and culture of Ireland, and in space exploration. He is a former head of radio news at Ireland’s national broadcaster, RTE, and was the BBC’s correspondent in Ireland for more than a decade in the Irish Peace Process. Leo is a fellow of the British Interplanetary Society and former chair of the Irish government’s science awareness programme.